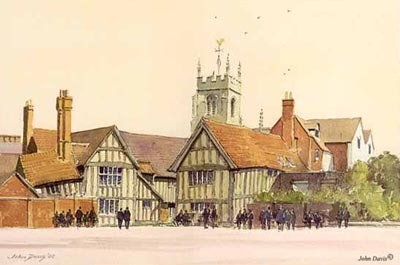 William Shakespeare (1564 - 1616) was born at Stratford-upon-Avon in a house in Henley Street. This is preserved intact. His mother, Mary Arden, was one of the daughters of Robert Arden, a yeoman farmer of Wilmcote: his father, John Shakespeare, was a glover and wool dealer of good standing who held the office of Bailiff of the Borough in 1568. From the age of seven to about 14, he attended Stratford Grammar School receiving an excellent well rounded education. At the age of 18 Shakespeare married Anne Hathaway, who was seven years his senior and three months pregnant. She was of 'yeoman' stock - her family owned a farm one mile west of Stratford in Shottery. He endured her until he could stand it no longer and fled to London to become an actor. He then became actor-manager and part-owner in the Blackfriars and afterwards the Globe Theatres. Shakespeare's acting career was spent with the Lord Chamberlain's Company, where he was a first-rate actor. The company was renamed the King's Company in 1603 when James succeeded to the throne. Among the actors in the group was the famous Richard Burbage. The partnership acquired interests in two theatres in the Southwark area of London, near the banks of the Thames - the Globe and the Blackfriars. Shakespeare returned to Stratford for his latter years where he died at the age of 52 and now lies at rest in his special grave at Holy Trinity Church. His 37 plays vary in type; historical romances, light, fantastic comedies, some are tragedies, all including the comical and the farcical. He was a shrewd business man, amassing quite a fortune in his time.